February 1980: Robyn and Brian Breheny (later Rowan Perigrynne and Brian Ornac) return from a trip to the USA and are inspired to create a Society of Creative Anachronism (SCA)-like group in Australia. July 1980: A group of wargamers at the Blue Room at the University of New South Wales in Sydney, New South Wales agree to form Society for the Current Middle Ages (SCMA). The first Crown Tournament is held between two fighters wearing motorcycle helmets, leather armour and using broom sticks – Brian Breheny and John Conner (later John of the Marshes). John Conner is victorious and is crowned the first King of Cumberland. The crown was a ring of brass fleur-de-lis made by Robyn Breheny (now Rowan Perigrynne). 25 October 1980: A second Crown Tournament with six combatants is held at Northside Liesure Centre in association with their medieval Festival. James the Sinister was crowned the new King of Cumberland. January 1981: The first edition of Runes – the group newsletter – was written and published by Robyn Breheny (now Rowan Perigrynne). February 1981: Runes 2 was published and included the first references to the Known World Handbook 1980 edition from the SCA in America. 25 April 1981: The third Crown Tournament was held at a park in Waverton. Torg of Hawkhurst was victorious, who was crowned as Baron of Cumberland, since the group now knew that they probably weren’t large enough to be a Kingdom. The first feast was held at the hall of St Giles church in Greenwich with bad food, good company and some great attempts at costume. Note: Outrémer was pronounced as oo-tra-meer. Artos the Blacksmith set up the first forge in Australia. July 1981: A Championship Tournament was set for August. The Champion would retain the title for as long as they could defend it in successive tournaments and was in charge of fighter training. The champions got an SCMA ‘peerage’ after 6 months in office. October 1981: The event known as Tolkon was held, including a tournament. There was also held a meeting to discuss the future – should the group build their own independent SCMA or join with the Society for the Creative Anachronism (SCA), which they now knew much more about (thanks to the Known World Handbook 1980 edition). With the benefit of this new info, it was agreed that the group was definitely not a Kingdom, but a Barony, and that Rowan would be Baroness. This was followed by a further meeting at the house of Robert of Stamount and Oriole of the Heights where a counter-stand by the SCMA group failed to materialise. November 1981: A Council Meeting at the house of Hrolf Herjolfssen and Madelaine the Bourgogne where the attendees pooled their student dollars and rang Aelflaed of Duckford, the SCA Steward in the USA. The group instantly was instantly declared a March Barony directly under the Steward until they could find a Kingdom to join. December 1981: Runes 4 was published as the fist edition for the Barony of Outrémer (photocopied by Selivia). Rowan Perigrynne, Baroness Outrémer, listed the decisions made at the recent meetings – that the group was now a Barony looking to the SCA. Initially they planned to join Caid, because they mistakenly thought that Caid was the closest Kingdom and that Caid was where the SCA had begun. 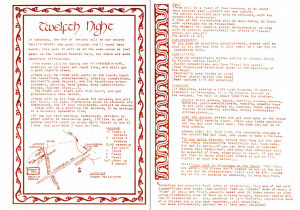 January 1982: The first Tweflth Night event was held at the Addison Road Community Centre. 120 people attended and many people made new garb specifically for the event. March 1982: A Tournament was held at Kane Cove National Park, including the first Bridge Battle. Note that the combatants were still using motorbike helms at this point. Tournament – hosted by the March Barony of Outrémer at Lane Cove National Park, NSW. James the Sinister was champion of the lists on the day, defeating Reinhardt Fenring in the finals. April 1982: A Swashbuckling Tourney and Baroness’ Birthday Feast was held on the 25th. The Barony of Outrémer was exchanging correspondence with Caid and the SCA Steward arranged for the Barony to receive a copy of all of the Kingdom newsletters. All members of the Baronial Council joined the SCA as official members and the first batch of devices are submitted. Regular meetings included fighting (all forms), dancing, arts and crafts, music and information exchanges and were held ‘every other Sunday (4th April, 18th April, etc)’ at Narwee Scout Hall, Hannans Road, Narwee, NSW from 1pm. Baroness’ Birthday Swashbuckling Tournament and Feast – hosted by the March Barony of Outrémer. The autocrat was Rhinehart Fenring. James the Sinister was victor of the tournament. Note: During this year, the Barony of Outrémer is renamed to the Barony of Rowany under the Kingdom of the West. Rowan Perigrynne is named the first Baroness of Rowany. The Australian region is named Lochac in this year, also. Picnic, Fighting Tournament and Feast – hosted by the March Barony of Outrémer. June 1982: The Barony of Outrémer planned a petition to Caid asking to join their Kingdom. They also discovered that they couldn’t use the name Outrémer, and that they needed a new name for both the Barony and the region. The Hit Kist of fighters made its first appearance. July 1982: The Balder’s Eve Feast was held. Baroness Rowan institutes the Order of the Golden Staple for extraordinary Baronial Service – the first recipients are Cordwainer Christia Barrett and Hrolf Herjoffson. The new Order of the Frantic Falcon is given to Oriole of the Heights and Alexios Thrakeses. August 1982: The Barony is notified of an SCA group that had started in Christchuch, New Zealand that was looking to Atlantia. The SCA group in Australia phoned the Christchurch group on 21 July 1982 – the first official, recorded interaction between Australia and New Zealand in the SCA. The Barony received lots of help from the West Kingdom and it was decided that Ambassadors would travel to the USA to select a Kingdom – Christia Barrett, Artos Barefoot and Rowan Perigrynne. A new shire starts up in Perth, called the Shire of Aneala Scir. Marit the Wanderer – 1 victory from 3 bouts. October 1982: Christia, Artos and Rowan travel to the Kingdom of the West and to the Kingdom of Caid, Rowan continues on to the Kingdoms of Ansteora and Atenveldt. They discover that their proposed Lochac device won’t pass – need to drop the bordure and the 5th star. The ‘baronial conspiracy to commit peerage’ succeeds and Rowan is given a Pelican by King Paul of the West, to be ratified by whichever Kingdom we join. December 1982: The first Rowany Festival is planned for Easter the following year. Rowan becomes the Seneschal of Lochac and Hrolf Herjolffsen is named the first Crux Australis Herald. Innilgard becomes a shire in Adelaide. 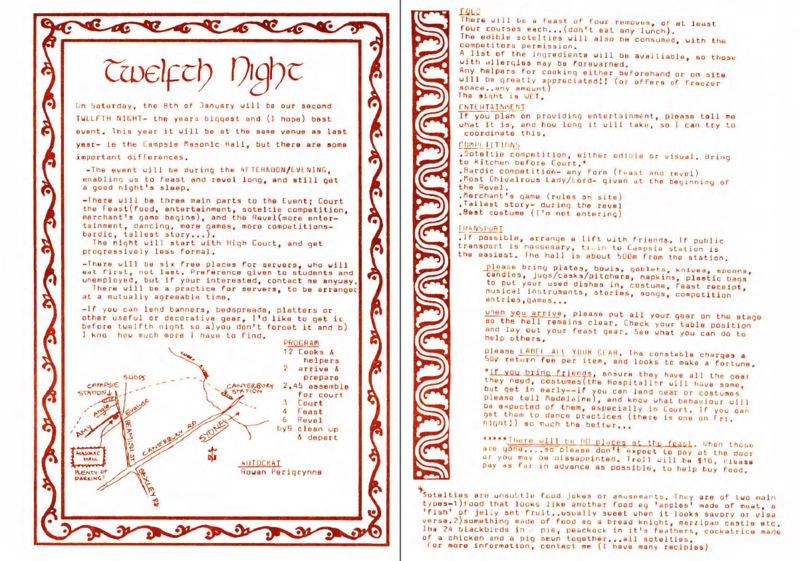 January 1983: Twelfth Night is held in both Rowany and Aneala Scir. The Australian SCA members joined the West Kingdom and a spate of awards were presented – a Rose Leaf for Cordwainer Christia Bartett and Award of Arms for Hrolf Herjolfssen, Hugh Louise de la Lautrin, Blair du Bois, Reynardine of Tara, Anne de Huegutt, Eamon Deime James Hennessy. Rowany Twelfth Night 1983 Advertisement, as published in Runes 9, December 1982.